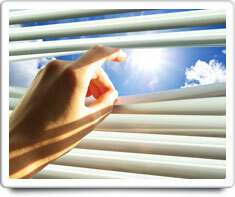 Drapes or Blinds are coverings that are placed over windows to block sunlight and/or provide privacy. Types of Drapes or Blinds include: Cafe Curtains; Priscilla Curtains; Vertical Blinds; Tab Curtains; Tent-flap Curtains; Venetian Blinds; Accordion Blinds; and Roll-up Blinds. Drapes, window blinds & curtains can be shut during the day to help keep sunlight out to help keep exterior rooms cool, as well as to reduce the fading of furniture and carpets. And they can be shut at night to help reduce heat loss from exterior rooms. Shown in the 'Routine Care' section are the recommended routine maintenance tasks for your drapes & blinds. The 'Q & A' section shows answers to common questions. And the 'Articles' section provides helpful articles about your drapes & blinds.